We found this nice chess profile in the Vancouver Sun. Tanraj Sohal has earned accolades in Canada by winning his eighth national chess title recently. Tanraj Sohal hopes to become a doctor but, first things first, he’d like to be a Grandmaster in chess. Sohal, a Grade 11 student at Fleetwood Park in Surrey, is well on his way to that goal. The 16-year-old just snagged his eighth national title at the Canadian Chess Challenge in Ottawa. The competition pits the best provincial school age players in two days of timed round robin play. “The games were pretty quick,” said Sohal, who holds the title of national master. He said his second round, against a player from Ontario was the most intense. “No game is easy. If you lose one game, you know you are not going to come in first. You can’t make any mistakes.” Competing is a lot of pressure, said Sohal, but he loves the game. Sohal describes himself as a combination of the two, with a “pretty universal style.” He admires Grandmaster and No. 1 ranked player Magnus Carlsen, a Norwegian that has been credited with bringing back the cachet chess hadn’t enjoyed since the 1970s, when American Grandmaster Bobby Fischer achieved celebrity status after routing Russian Boris Spassky. Like anyone his age, Sohal loves computer games, but he’s more likely to spend hours a day playing chess online. 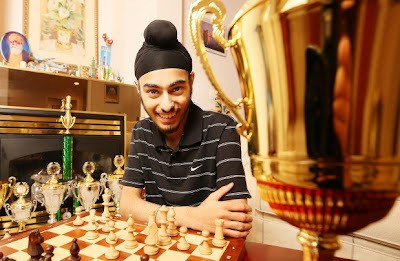 Computers also allow players like Sohal to play against other highly skilled players around the world in live games on the Internet, invaluable experience that would have been impossible for young players even a decade ago. If he keeps advancing, and winning, in the chess world, medical school just might have to wait. Great job Tanraj! We are proud of you.